Want to know a royal flush from a full house? Here are the top 10 winning poker hands ordered from highest to lowest – so you always know the best (and worst) cards to play. Click here for the best poker combinations overall. Or click here for the top Texas Hold'em starting hands. 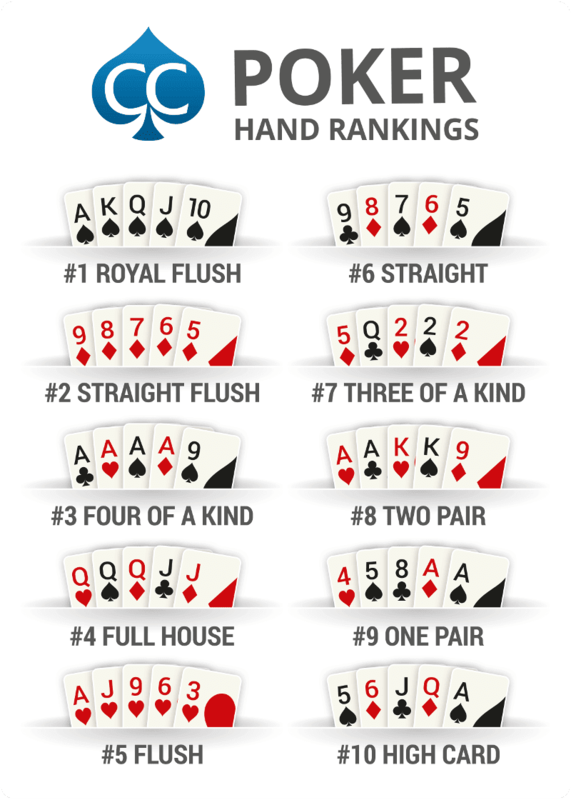 Download & print our free poker hands ranking chart – or save it to your phone. Keep it handy when playing so you always know what poker hand beats what. Best possible hand in poker. Ten, Jack, Queen, King, Ace all in the same suit. Five cards in a row, all in the same suit. The same card in each of the four suits. Also called a Full Boat. A pair plus three of a kind in the same hand. Five cards, all in one suit, but not in numerical order. Five cards in numerical order, but not of the same suit. Sometimes called Trips or a Set. Three of one card and two non-paired cards. Two different pairings or sets of the same card in one hand. One pairing of the same card with three other non-matching cards. No matching cards, not in consecutive order and at least two different suits. This one is a poker classic. The strongest starting hand in poker, pocket aces are a strong pre-flop favorite over any other two cards and a 4:1 favorite over almost any hand. You will be dealt 'pocket rockets', as they are also known, on average once every 221 hands, so it makes sense to get excited about them pre-flop. However, it's worth remembering that their likelihood of winning goes down as more players enter the pot, so the fewer opponents you're up against the better. Pocket Kings, also known as 'cowboys', are a favorite against any hand (except aces). There are not many flops that should make you too worried – however, it is worth remembering that kings will only win against a hand with one ace just over two thirds of the time. You will almost always be happy to get your money in pre-flop with pocket kings. If you get dealt pocket queens, you are safe in the knowledge that only eight overcards are left in the deck, or even fewer if you get your money in against an opponent with an ace, a king, or ace king. You will want to play this hand strongly before the flop, raising or re-raising from any position almost all of the time, and you will still frequently run into plenty of opponents prepared to commit their money with weaker hands. This hand is often nicknamed 'Anna Kournikova' by recreational players - it's pretty to look at, but doesn't win as much as you think it should. It is easy to fall in love with ace-king suited, and it is by no means a weak hand, winning against all pocket pairs half of the time (except for pocket aces and pocket kings). However, it is also worth bearing in mind that if you don't connect with the flop, then you just have ace-high. It's a classic poker saying that there are three ways to play pocket jacks, and all of them are wrong. However, this is a bit of a cliché, and the hand is a favorite or coin-flip (50:50) against any unpaired hand and a strong pre-flop favourite over any lower pocket pair. It is still a very strong hand, particularly if the pot is unraised and you look down at jacks in late-position, though you can be a little more careful if an opponent has come in for an early-position raise. Pocket tens are a strong starting hand and a real poker classic. They&apos;re strong enough that you don't need to hit a third ten on the flop to continue. They will still win against overcards every other time, though there are far more combinations where it is not as strong a favorite as pocket jacks. If there is a lot of action before you, it is sometimes easy to fold tens before the flop. While this hand is an underdog against an offsuit Ace-King, it ranks higher due to its relative strength against other starting hands. Sometimes, you will find yourself in a spot where you need to fold, even after hitting a pair on the flop. However, if you completely miss the flop, it's easier to stay out of trouble with an Ace-Queen. Weaker than its suited counterpart due to its decreased likelihood of hitting a flush, an offsuit ace-king will still win at least 40% of the time against any hand other than aces or kings. Sometimes, it is worth calling in position with this hand before the flop to keep the pot small and still get paid if you pair one of your two hole cards. Like a suited ace-king or ace-queen, this hand can make a royal flush. However, it is one that is worth playing more carefully; especially if a player has raised from early position. Any ace-king or ace-queen combination still has you beat if you pair your ace, so you don't want to fall in love with an ace-jack. Just edging out ace-ten suited and pocket nines, king-queen suited is a hand that is said to 'flop well'. It can make a large number of straights and flushes, while just hitting one pair will sometimes give you the best hand. However, you should be able to fold this hand fairly easily if the action before you suggests other players are entering the pot with a strong hand. The best hand in Texas Hold’em is a Royal Flush. This hand consists of an Ace, King, Queen, Jack, and 10 of the same suit. A Royal Flush is unbeatable by any other hand combination. A Royal Flush differentiates from a Straight Flush, since it is a sequence or straight of the highest possible cards within a suit. Can a Royal Flush be any suit? Yes. As long as the cards making up the Royal Flush consist of one uniform suit, then the suit itself does not matter. In a deck of 52 cards, the probability of the first player to receive one in a game of Texas Hold&apos;em poker is approximately 1 in 30,940. How does a Straight Flush work? A Straight Flush is a poker hand consisting of five cards that ascend or descend in number or rank, as well as all in a single suit. For example, a Straight Flush could consist of a Queen, Jack, 10, 9, and 8 of the same suit. In terms of value, the Straight Flush comes below a Royal Flush and above a Four of a Kind. In the forty possibly poker combinations of Straight Flush hands, there are some that come more valuable than others with the highest being a King-high Straight Flush. The value of the Straight Flush is judged by its highest ranking card. An Ace-high Straight Flush is a Royal Flush, and therefore beats all other hands. What does a "Full House" mean? Other than being a much loved situational comedy from the 1980s, a Full House in poker is a hand consisting of three cards of the same number or rank, and two cards of another. For example, a Full House hand could be three sixes and two kings. Full Houses are ranked by the number or rank of the triplet, followed by the rank of the pair that follows. This means that not all full houses are equal, as royal flushes are. Thus AAA66 (Aces full of 6s) would beat AAA55 (Aces full of 5s). What does a Flush beat? 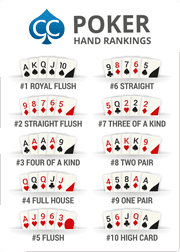 In the hierarchy of hands, a Flush beats any high card hand, a single pair, two pairs, three-of-a-kind, or a straight. A Flush loses to a Full House, Four-of-a-Kind or a Straight Flush. However, when two flush hands are in competition, the value of the flush hand is judged by its highest ranking card – a hand consisting of a King, 8, 7, 4, and 2 is higher in value than one consisting of Queen, Jack, 9, 7, and 3. Which suit is the highest in poker? In Texas Hold&apos;em, no suit is considered "higher" or more valuable than another. Though there doesn&apos;t tend to be a standard suit ranking in poker as all suits are created equal, some games incorporate a ranking system to suits. The most common suit ranking goes in this order (from lowest to highest): clubs, diamonds, hearts, spades, with spades being the highest or “Trump” suit. Suits can be used in some games as a tie breaker for like hands. Do I need to memorize classic poker hand rankings to play? No, but it certainly helps to be aware of which hands beat which to have foreknowledge while playing. Download our hand ranking PDF and cheat sheet for an easy-to-use list of which hands beat what: hand rankings. How many cards do you play poker with? Players in Texas Hold&apos;em begin the game with two "hole cards", with another 5 shared cards in the middle of the table (also known as “The Board”) dealt out in 3 rounds (the “Flop”, “Turn”, and “River”). Out of the 7 total cards you must make your best 5-card hand. The deck itself consists of 52 cards made up of 13 cards (Deuce through Ace) from each of the four suits (spades, hearts, diamonds, clubs). How do you deal cards for Texas Hold&apos;em poker? At the beginning of a game of Texas Hold&apos;em, each player at the table is dealt two face-down "hole cards", which no one else at the table can see. There is a "pre-flop" betting round, where players can check, bet, or fold their hand in turn. Next, the dealer places three shared, or "community" cards face-up on the table, or board. This is called "The Flop". Another round of betting ensues, after which another card is added to the community cards. This is called "The Turn", which is followed by another round of betting. Finally, the last community card is dealt face-up on the table, otherwise known as "The River". At this point, players create their best 5-card hand using the community cards on the table or "board" and their two "hole cards". A final round of betting occurs, and a winner is decided. When dealing a live poker game, it is important to note that before the Flop, Turn, or River cards are dealt, the dealer must deal a “burn card” before each street. The burn card is always dealt facedown, out of play, should never be seen by the players or dealer, and does not have any influence on the hand. Will a poker room's software tell me if I have won? It depends on the online poker site and how it works – all sites will have a clear indicator to tell you if your hand has won, but during the hand it's important to know the rankings as play progresses so it&apos;s well worth learning what beats what in poker. It might be useful to play for free with play money chips to get a grasp of how the game works before betting real money.